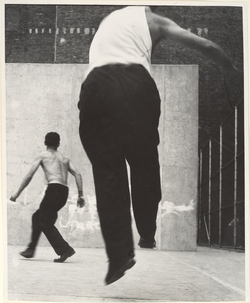 While reviewing some survey of photography books a few years ago, one particular image stuck in our mind of some NYC handball players shot from the rear in an exacting composition that captured the action of the game perfectly. Now, that photograph is included in an interesting look back at the work of Leon Levinstein at the Met. Leon Levinstein (American, 1910-1988), an unheralded master of street photography, is best known for his candid and unsentimental black-and-white figure studies made in New York City neighborhoods from Times Square and the Lower East Side to Coney Island. This exhibition, drawn exclusively from the Metropolitan’s collection, will feature some forty photographs that reflect the artist’s fearless approach to the medium. Levinstein’s graphic virtuosity-seen in raw, expressive gestures and seemingly monumental bodies-is balanced by his unusual compassion for his offbeat subjects from the demimonde.